We use technology every day in this class. 1. This material is important because you will be applying it to real life. 2. We will be using examples of real things that you may or may not have already done in your life. 1. Through fun lessons that keep you involved. 2. 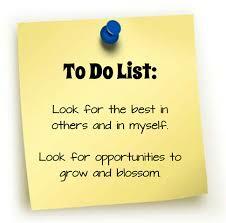 You will have notes to take, but you will also be doing projects, to help you and your fellow students. 3. Daily homework assignments will also be given in order for you to practice those days material and so that you may reflect on what you learned. 4. Some of the projects will be done in groups, as well as some of the in class activities. I want you to be able to figure some things out for yourselves using prior knowledge and knowledge that you have gained in this class. 1. Two pencils and one red ink pen. 2. Two-Grid Notebooks for notes and homework. 3. Two 2 Pocket with Prongs Paper Portfolio for your homework, and other class papers. Grading policy is subject to requirements quoted in the LISD handbooks. Grading is not about a number; but instead, is an assessment of what the student learned about the curriculum being taught. The average of all Formative Assessments will be counted as 50% of your six -weeks grade. Informal Assessments: (Weekly Exams, Pre-Tests, Ongoing Assessments, Cumulative Tests). Tests will fall every Friday. The average of all daily work [Summative Assessments] (Drills/DCR, homework, and assignments) will be counted as 50% of your six- weeks grade. Make Up/ Late Work will have a 50% of the value of the assignment (unless a legitimate illness). Quizzes may be administered at any time and may or may not be announced. All tests and quizzes must be corrected and placed in your binder by the following Monday. Corrected Math binders will be checked at this time as well. 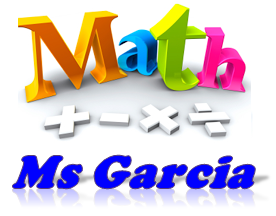 Homework assignments are posted on Ms. Garcia’s blog and will be turned in at the beginning of the next class. Your six – weeks Math binder has a weight of a test grade each time that it is checked. It will be checked at the end of every six weeks. A maximum of 100 pts. may be gained on each daily assignment with regard to percent correct and complete. A maximum of 100 pts. may be gained on each test assignment. Any assignment not received at collection but still on that same day will be reduced by 10 points. Any assignment received the following day will be reduced by 50 points. All work will be completed satisfactorily at my discretion. My grading policy is subject to change according to the policy of the School District. Regular school attendance is essential for the student to make the most of his/her education-to benefit from teacher-led activities, to build each day’s learning on the previous days, and to grow as an individual. Attendance is important. You’re in class every day to learn, keep up with class assignments, pass your classes, and prepare for state mandated tests. A student is required to attend all class meetings. If a class is missed the student is held responsible for the full requirements of the class. Students lose credit automatically after the 8th absence (excused or unexcused. There is no distinction between an excused and an unexcused absence. Both will be counted equally. * A student absent from school for any reason, upon returning school, must bring a note signed by the parent that describes the reason for the absence. An absence slip will be required to return to class. * The student has to make up work missed due to any absence within two school days. If you have to go to the bathroom, you must raise your hand and ask to do so. You must sign the Sign In/Sign Out notebook and get a pass before you leave the room (one boy and one girl at a time). You will not be allowed to leave the room during the first 10 minutes or last 10 minutes of a period. You will not be allowed to leave during the 1st and 6th periods. I firmly believe that most people can be successful in school and that the amount of hard work, dedication, and sacrifice is what separates those who are successful from those who are not. If you are absent, you want to get the assignments and notes as fast as you can. If you can, call your classmates and ask them for the assignments. If you can’t call anyone, you should ask your classmates for the work in the morning on the day that you get back. This site is NOT meant to be a replacement for lessons taught or activities done in class. Welcome to my Math Blog where you will find some of the different activities we do in class daily. This year many students of Memorial Middle School are taking their Math lessons with me. This is an exciting experience for all of us and we hope to learn and have fun at the same time. It is my ultimate goal to help students understand and like the Math subject. I hope this site helps you understand what we do in class every day. Please do not hesitate to ask me questions or to suggest changes to my blog. Do you need help with a topic that is not on this site? Would you like this site to provide a link that has been helpful to you? Is there a link that does not work properly? Do you have other questions/concerns? This entry was posted in Uncategorized by marutrevino. Bookmark the permalink.